CAPE CANAVERAL, Fla. – NASA has accepted delivery of a key European part needed to power the world’s next-generation moonship. U.S. and European leaders gathered at Kennedy Space Center on Friday to mark the occasion. 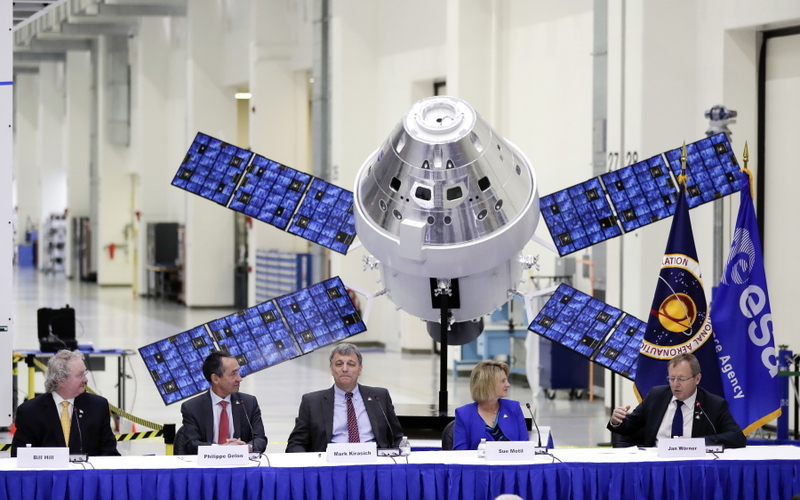 The newly arrived powerhouse, or service module, will propel NASA’s Orion capsule to the moon during a test flight without passengers scheduled for 2020. A mega rocket under development at NASA, known as SLS for Space Launch System, will launch the combo. The European component “allows us to take people farther into space than we’ve ever gone before, so it’s a really big event for all of the Orion program, “said NASA’s Orion program manager Mark Kirasich. Orion and the attached service module are meant to fly near the moon, but not land. Future missions will carry astronauts, with the goal of building an outpost just beyond the moon that could enable lunar landings and Mars expeditions. 960s and 1970s. On its only spaceflight to date, the Orion capsule soared more than 3,600 miles above Earth in 2014. The second, considerably more distant demo will come in 2020 with the Orion and service module; that will mark the SLS launch debut. This function has been repeatedly delayed.